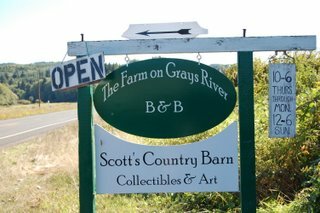 This is the sign you’ll see when you get to the bed and breakfast that my brother Bob and his wife have in Rosburg, Washington. 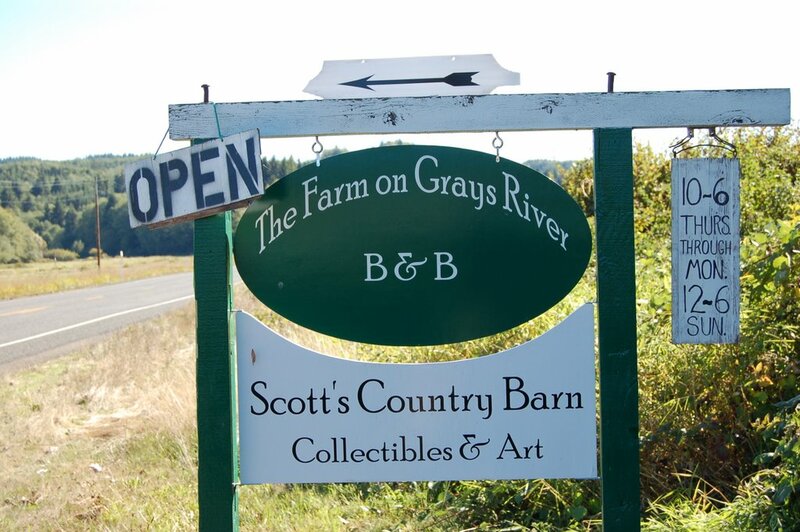 My sister-in-law Georg keeps a gift shop in the barn with antiques and Mexican art. 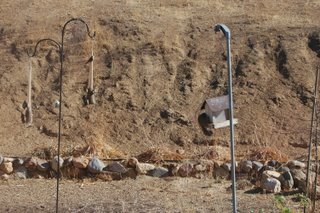 My brother, in addition to being a compulsive landscaper, has a flock of sheeps and goats of various mixtures and varieties. Last year Georg traded B&B time for a black Welsh Mountain ram who provided great amusement when his little ram self chased all the big girl ewes. They weren’t laughing this spring when they had 28 black lambs on the ground. Nice bonus. 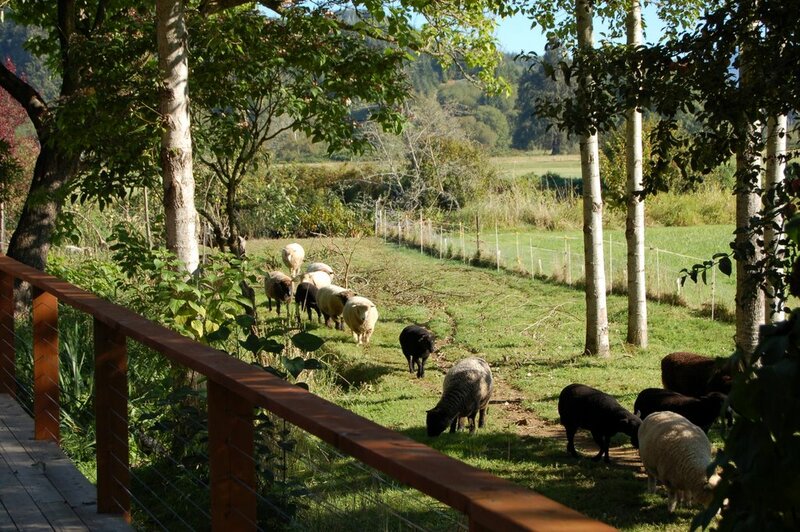 Bob has fenced with hot-wire between pastures so that they pass by the guest rooms. When we were leaving last month, Bob came back from the animal barn with a gunny sack of black fleece. He is always interested in projects and outcomes and thought I might like to try some of the fleece, just because. I should have known when it didn’t stink in the car that it was lambs fleece and couldn’t be a full growth. Bob and I come from a long line of story tellers and he loves a story even more than I. I got to thinking that he would really enjoy a hat from this fleece, if nothing more than for the story. I sat on the porch one morning and sorted through the fleece bits and parts until I thought I had enough to make one hat. I don’t think any staple exceeded 1 ½ inches and when I tried to drum card it, half of it ended up on the licker. Spinning it was like working on drier lint with the texture of brillo pad. 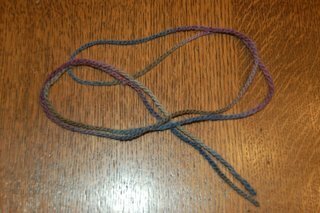 I am a rank amateur in long draw and since that was the only way this short fiber would spin, coupled with the harsh fiber and my technique, or lack thereof, I ended up with a yarn that measured four stitches per inch – hardly hat yarn. I’m going for the story, not the hat. 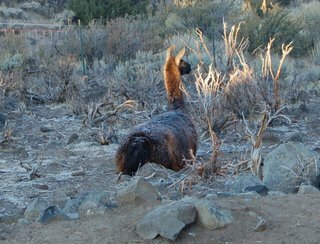 I don’t know what the optimal use of the fiber of this breed would be and since I didn’t have a representational sample, I won’t know because I don’t think I would willingly work with Welsh Mountain fleece again. Bob will enjoy the story. This I know. This morning Ian called to me from the bedroom window. I went to see what he wanted, and this is what I saw. 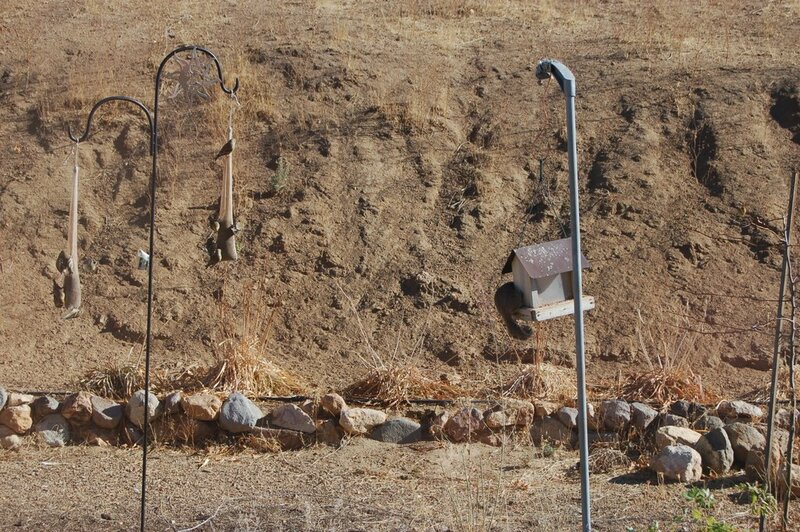 Take a look at the bird feeder on the right. 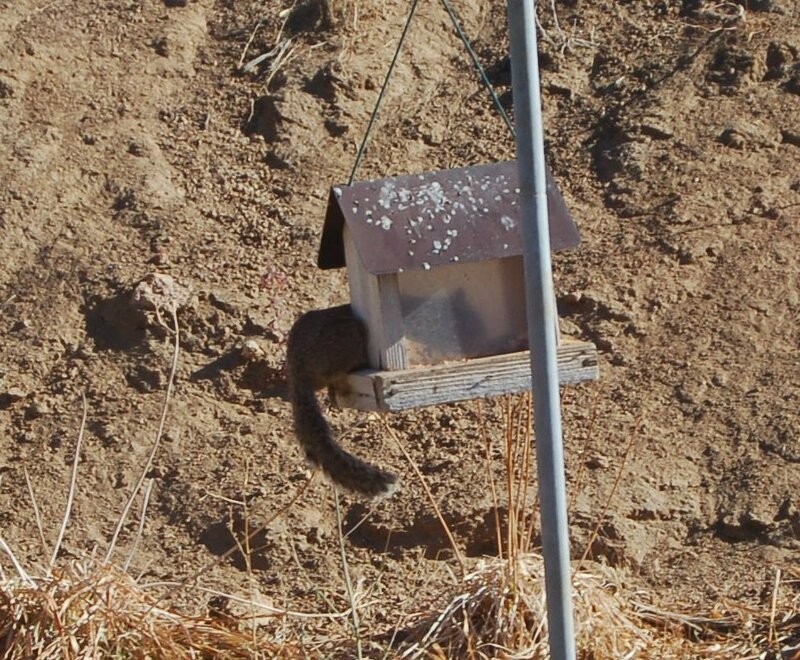 Think he's a flying squirrel? 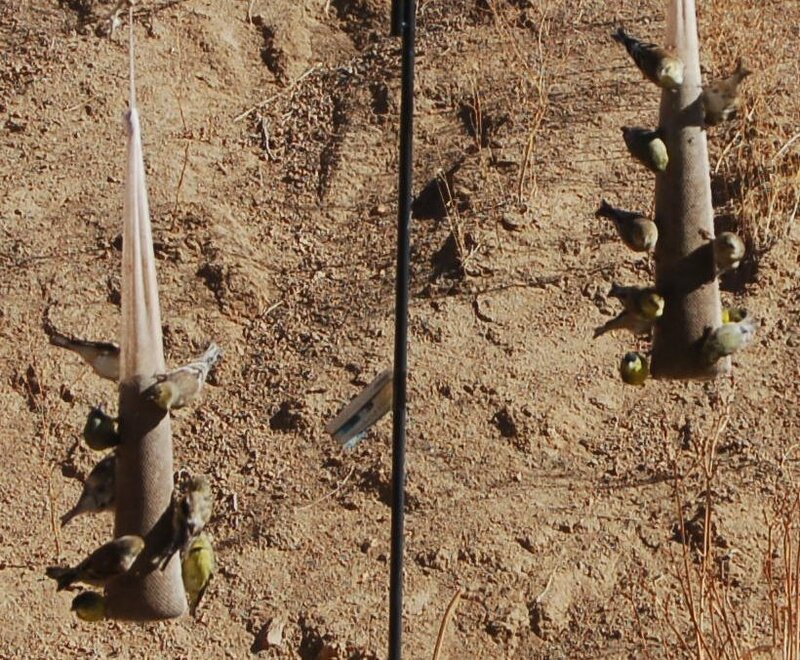 How many gold finches can feed on a thistle sock?! It was nice to be home. Oddly enough, today was a paid holiday for me. October 31st is Nevada Day, but because it conflicts with Halloween, the powers that be decided to make the state holiday this Friday. Library staff who are off on that day received a different day, and I was assigned today. So I’m celebrating the birthday of our state one week early. How did I celebrate? 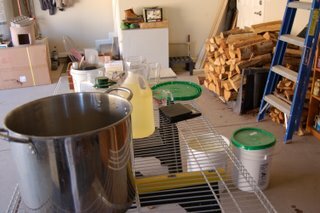 The only thing that I felt compelled to do was make soap, so I sat on the deck for a while this morning and spun. The weather is still quite warm here. Then after the soap and lunch, I decided to go up to my studio and weave a little on my scarf since its been on the loom so long it’s collecting dust. I haven’t been able to make me work on it because I was sure I was going to run out of the colored yarn. The scarf was our guild’s fiber project this year. 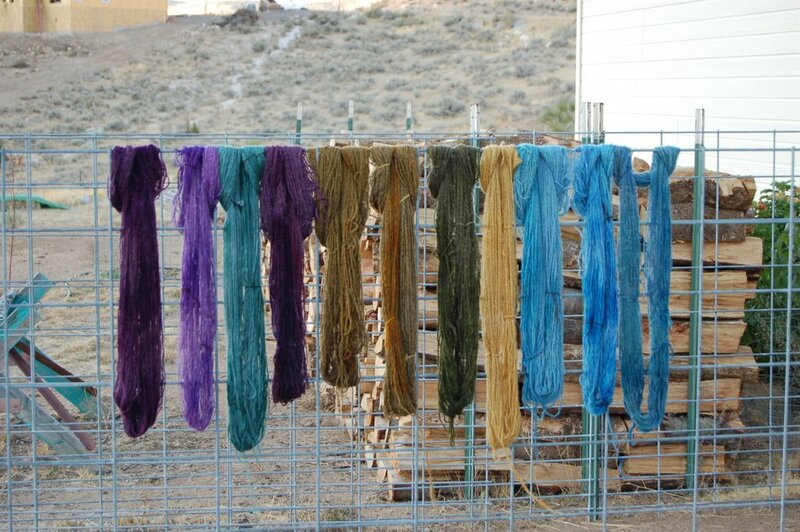 We used to always do a traditional fiber exchange but the last couple of years, we’ve changed it so that everyone receives the same fiber to spin and dye as desired. For this year Wes and Brenda came up with the idea of providing each participant with dark brown medium wool, some white medium wool, silk and angora. All the fibers were clean and in a kit so everyone received the same thing. 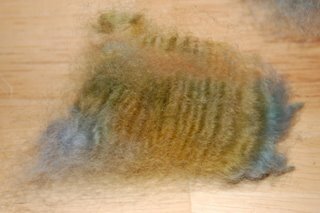 I decided to blend half of the silk and angora with each of the two wools, then I rainbow dyed the white wool and overdyed the dark brown with a light bath of black. 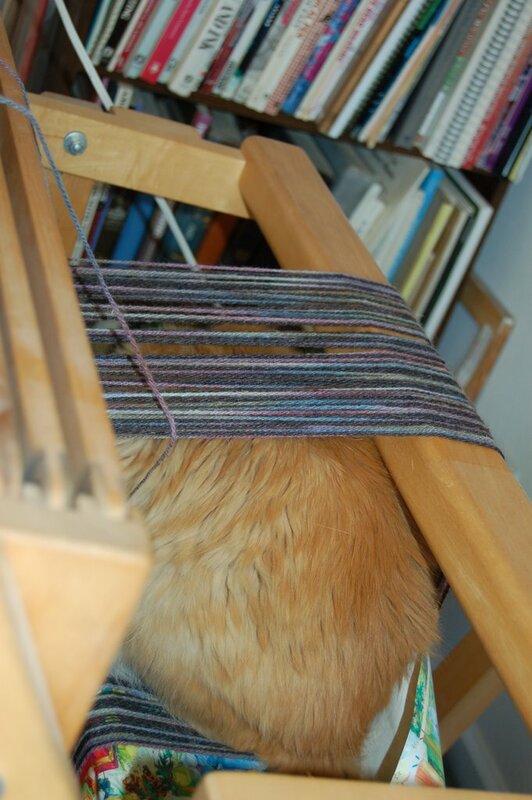 Then I wound a three-yard warp for log cabin and set to work. After weaving about ten inches, the light went on. I hadn’t calculated the yardage and I was sure to run out of the dark. 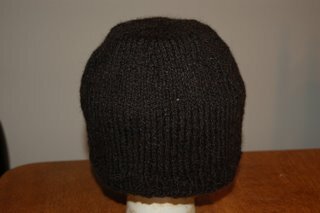 So I set out to replicate that yarn with some black Corriedale I have. I’m so glad I did the light black bath because the replicated yarn is almost indistinguishable. There has to be a better way to twist fringe. When I got done, this is how much I had left of the colored yarn. The locks are lovely, and I’m reminded why luster long wool is called luster long wool. 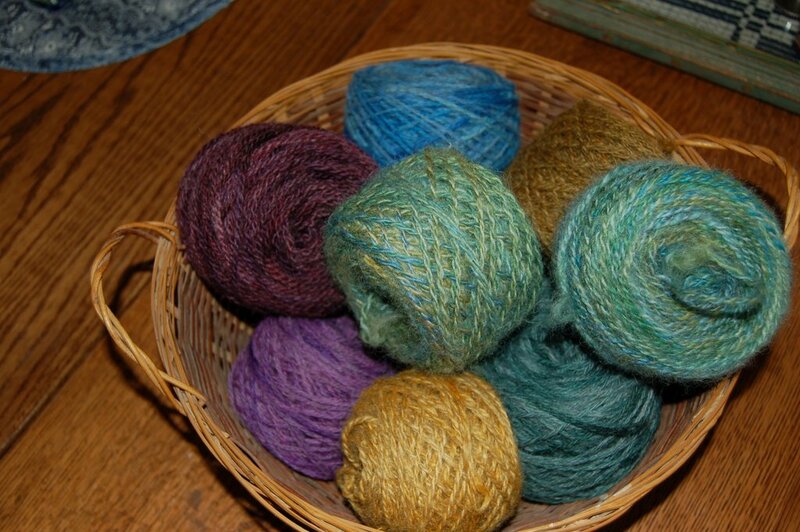 I was taken with spinning Border Leicester wool from the beginning. The other morning I was trying to think how it came to my attention and realized that it was Diane Soucy. She had sent off for some locks from different shepherds she had found on the Internet. We were eating lunch at the In-and-Out-Burger in Auburn en route to Robin Foquette’s ranch in Cool, California for her spring shearing. 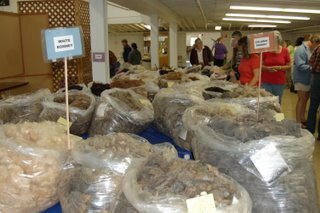 Diane had some samples from Ralph Groefsema in Mountain Home, Idaho, who, in fact, just this year announced his retirement from shepherding. 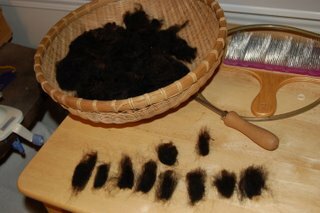 I bought a Jacob fleece at the shearing, then went home and called Ralph for some samples of my own. Over time I think I probably bought a half dozen fleeces from him. But then I got sidetracked by my inability to turn luster long wool into a garment that satisfied me. It’s just not the ideal sweater yarn. I hope you can see the shine on this lock I have two partial fleeces left from those that I bought from Ralph and am finding that I love the way they look in felted bags. They have a halo, almost like Angora. I don’t know if that’s true of all BL or just the ones I bought from him. He liked to dabble with a little cross breeding here and there. The locks were dyed with leftover dyes from my dye day, so I expected that the yarn I made from them would be a nice fit. My disappointment is that I had already used up all the purple so that’s absent. I had anticipated variegated colors and this yarn is pretty boring, really. This is my soap, or rather where my soap is aging. 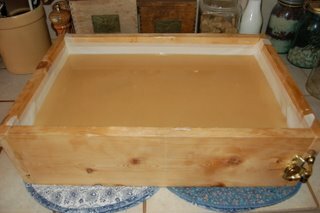 I have seen elaborate storage facilities on TV craft programs for homemake soap to cure, but this homemade soap maker is on a budget. It's important for soap to age where the air can circulate around it, so I've taken the plastic racks from plant nurseries and stack them on top of a square laundry basket to provide the environment that the aging soap needs. It's in our guest room and boy does it smell good in there right now. Here are the raw bars, and they really do look raw. There are so many steps that go into making the bars look pretty. I bought a recommended tool for beveling the edges of the soap but found that I still prefer a good old potatoe peeler. And I say old, I mean it. It was in a basket of wedding presents when I got married in 1968. I've owned it from the beginning and it's an antique. I'm getting close to being one myself. And this is what the bars look like when they're done. 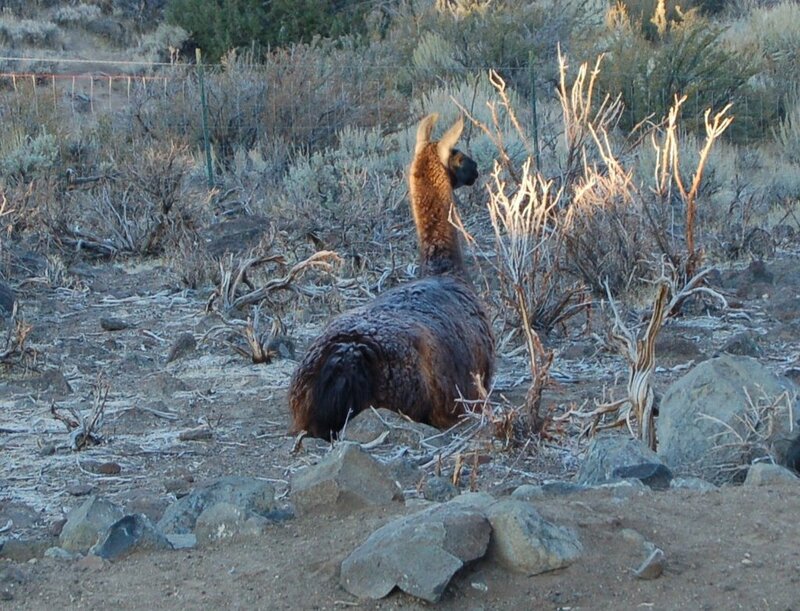 I don’t know why we said it or where the expression came from, but when the weather turned and we saw the frost on the grass, we used to say, “The frost is on the pumpkin.” That’s what I thought when I looked outside this morning and saw Zephie cushed in the emerging morning sun. Her ears are up because she’s focusing on the sounds of yipping coyotes. 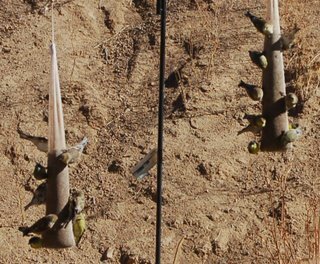 The dogs are the other sound you can’t see – they’re frantically and authoritatively barking, demanding the offenders leave. The coyotes don’t care – they’re on the other side of the fence. It’s all about jurisdiction. Two days ago it was still an Indian Summer. This morning it is definitely Fall. 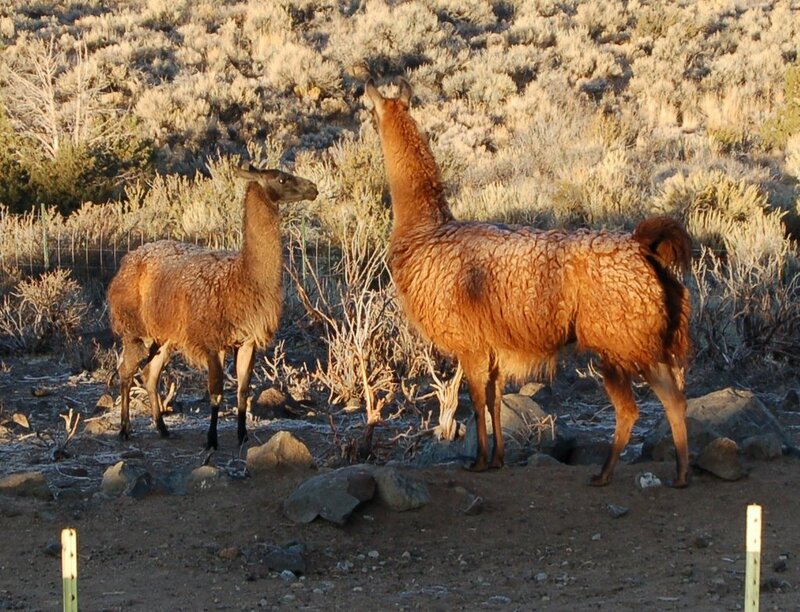 The llamas are in their element. The evil hot days of summer are passed. They were doing the air spitting thing just before I rushed in to get ready for work. I always rush to get ready for work. 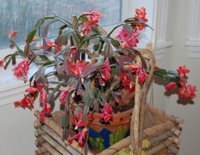 Inside the house, the Christmas cactus is kinda pushing the season, doncha think? 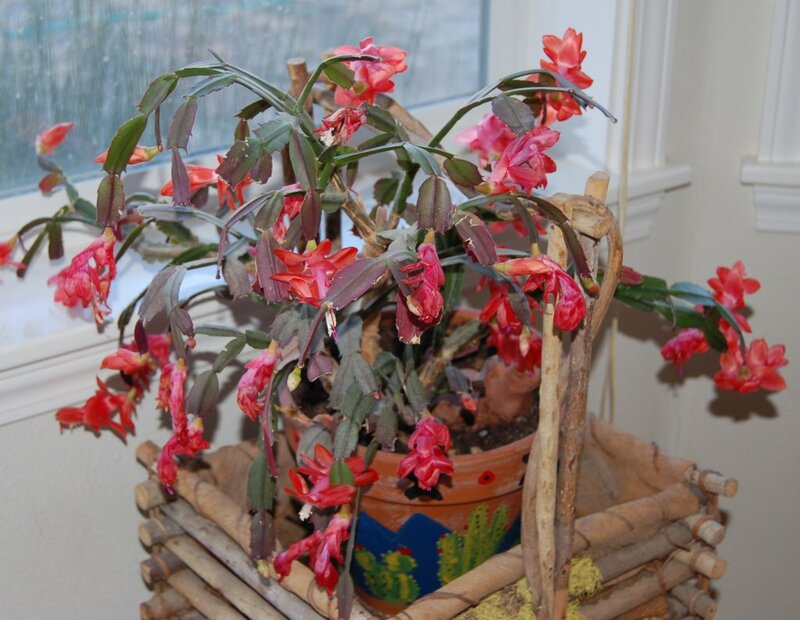 I’ve had this plant since I moved to Reno from Sacramento in 1975. It has been larger at times but it has suffered animal trauma on numerous occasions. My mother started it in a teacup, the spring propped up with a salad fork. 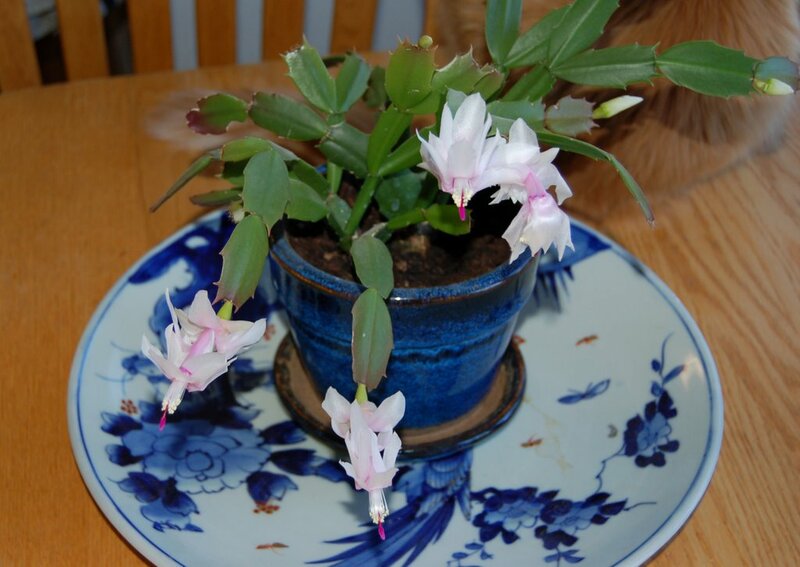 At the time it seemed like no big deal, but she loved her houseplants and I’m so pleased to still have this part of a plant that she cultivated. This is such an unusual color. The starter came from our elderly neighbor and I’m also pleased to have this part of her in our home. She was one of the first to move out to our valley, going on 30 years ago. We held an open house just three weeks after we moved into the house – we were so excited to be here. Our neighbor came and brought us photos of the valley and our parcel, pictures she had taken when she first moved out here. The photos are upstairs in an album, but I get to see her plant everyday and I'm honored. 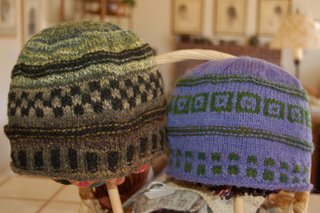 I'm quite happy with the hats I've made this past year or two, but I've decided that I'd like to display my handspun yarns a little differently. I had plently of time while we were on vacation to swatch and tear out and I have decided that I'd like to try corrigated ribbing and some garter stitch. These are two hats that I've finished. I'm a little conflicted between using my yarns for felted bags or hats. I guess it just depends on how much I spin and how much yarn is available. These projects certainly have helped with my out-of-control stash "sitchiation." 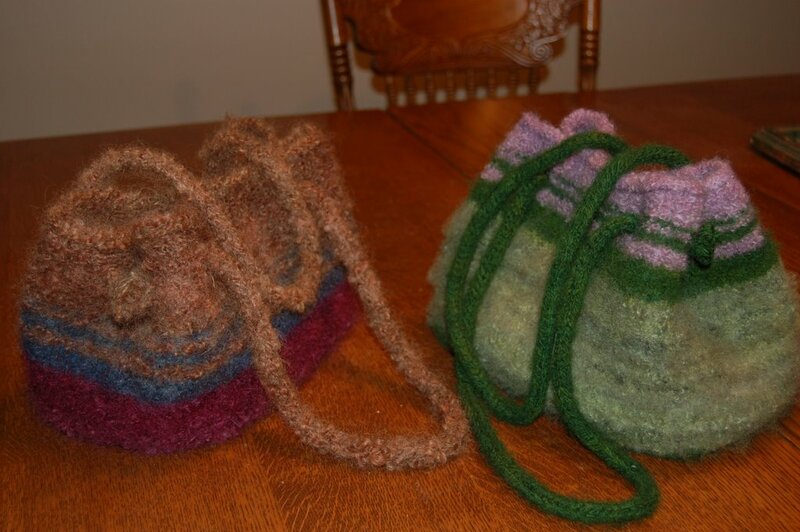 Felted bags are yarn hogs. Amy came back from Black Sheep Gathering with a dichroic glass button and said, “Here – design something around this.” And I knew what that something would be when Allison visited me at the library and took something of our gorgeous purse, a felted bag with button closure, pattern by Beverly Glaskas. She said she’s made several and has loved the pattern. She didn’t have any at the store and said she’d get one for me. I didn’t have any yarn for it so didn’t think about it too much. Then we did the natural dye day at Marilyn’s two months ago and I ended up with colors that I thought would be perfect for the bag. 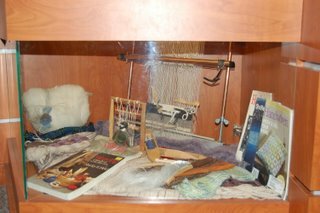 But that yarn is currently in a basket in the library display, and they’ve asked me if I would be willing to leave it another month. Still no pattern, still no yarn. Thursday, my birthday, I came home from work to find that Allison had mailed the pattern to me as a gift. She had no idea it was my birthday. Is that karmic or what? 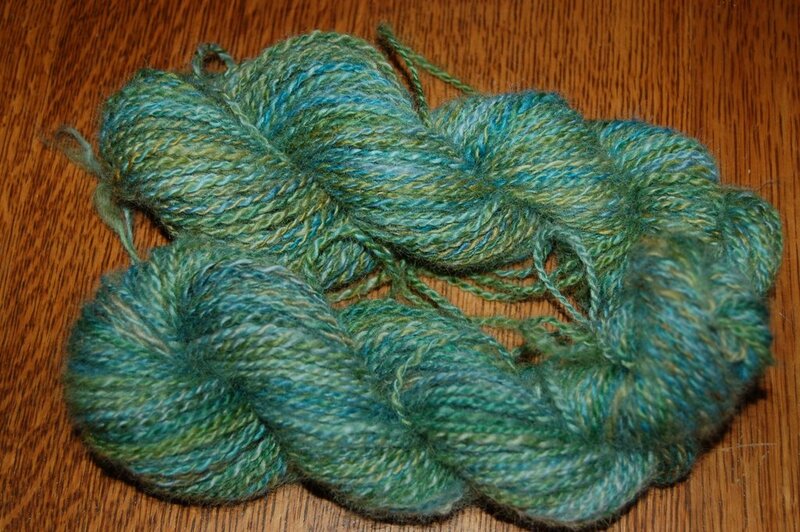 So on my day off yesterday in a birthday playday splurge, I dyed the last of the Coopworth that have been spinning for months. 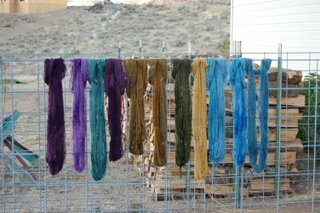 I also added a couple skeins of Danny, a Rambouillet/Corriedale/Suffolk, fleece that I bought from a friend years ago. It was seven pounds. When I bought it I had no idea just how huge a seven-pound fleece is. 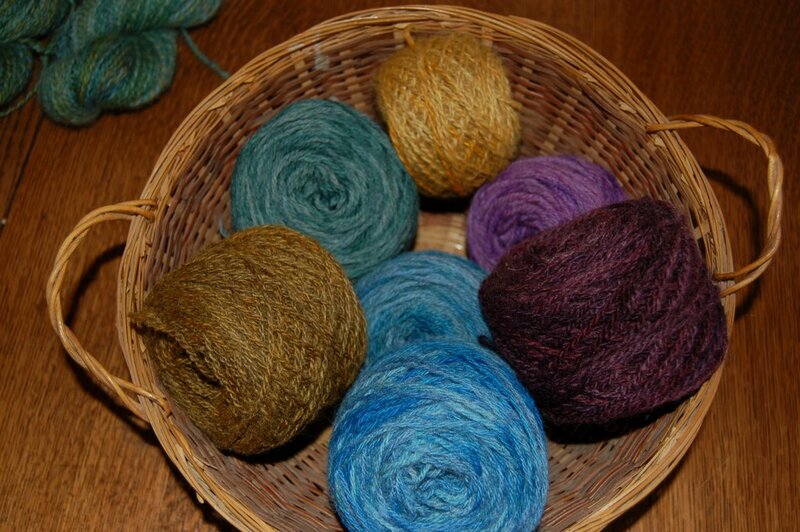 I put the dye on the skeins, rolled them up in saran wrap and steamed them, three packets in the steamer at a time. I wanted uneven color so laid the packets on their sides so that color would drain to one side. It worked and it’s either going to be an asset to the felted bag or it’s going to be a terrible idea. 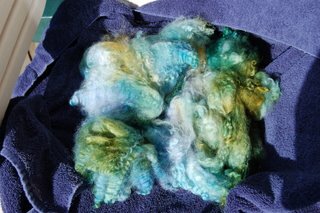 At the bottom of my bucket of soak water, I put a handful of white Border Leicester and when all the skeins were wrapped. I put the fleece on a piece of wrap, poured the remaining dye on it and then steamed it too. I love the colors and can’t wait to spin it up. I can’t decide if it’s going to get one pass through the drum carder or if I’ll flick card it. 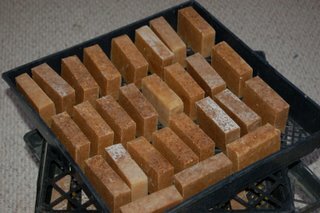 I haven’t make soap in a really long time, and the longer I put it off, the more I seem to dread making soap. Today was the day. It was so much easier to take the car out of the garage and set up my skirting table. That was the first thing I did differently. The second thing that really made is easier was to use all the ice from the icemaker that we installed in our refrigerator several months ago. I was able to cool the oils and lye down quickly. I wish I had thought of both a long time ago. You can see the two five gallon buckets of coconut and palm soap oils. I buy my supplies from The Soap Saloon in Sacramento. 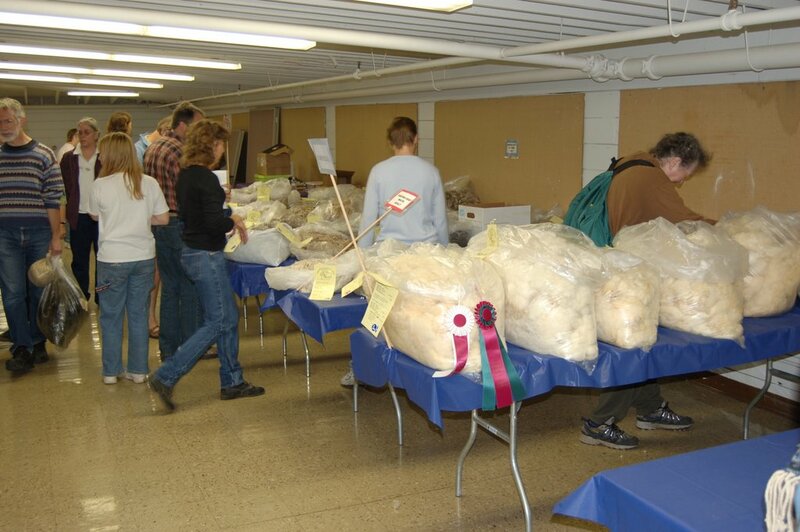 Last year when Amy and I went to Lambtown, I stopped by and picked up two buckets - shipping is pretty expensive. Here the oil is hard or semi-hard and often I have to cut it with a butcher knife to weigh it, so I was surpised to hear the oil sloshing in the back of the car. It has never been liquid here and I realized that in some places, it really is oil. I always mix the lye in the garage - it's just plain nasty. I pour my oils and lye together at 86 degrees and stir for nine minutes. It’s like pudding at trace. I’ve seen women on the HGTV craft shows use an electric stirring thing and it’s really stiff when they put it in the mold. 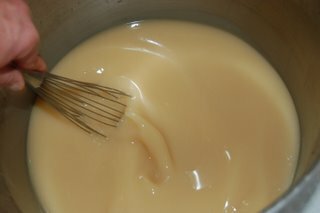 I like using the French whip and pour when it’s like a very thick white sauce. See – I used to know how to cook and I cooked from scratch, making my own sauces, no canned soups. That was my organic phase. Come to think of it, I'm still in my organic phase, just a different chapter. Why else would I go to all this work to make vegetarian soap? 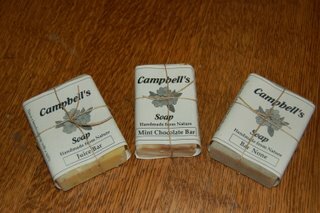 I do scent the soap, but I only use essential oils, no fragrance oils which are synthetic. Essential oils come from real plants and that's they're real expensive. I use a wooden mold that I had made for me years ago, and I line it with waxed butcher paper. It’s actually an origami box that I fold and then fit inside, securing with masking tape. Right now, the soap is one gigantic bar. I learned the hard way that when I’m making my infant soap all cozy, I need to do it both from the top and bottom. You can that I’ve put quilted place mats underneath. It’s important that the soap doesn’t cool too quickly from below. And here it is all tucked in, snuggly warm. This is a very special quilt that was had made for us by my sister-in-law’s mother, who has known my husband since he was in high school. 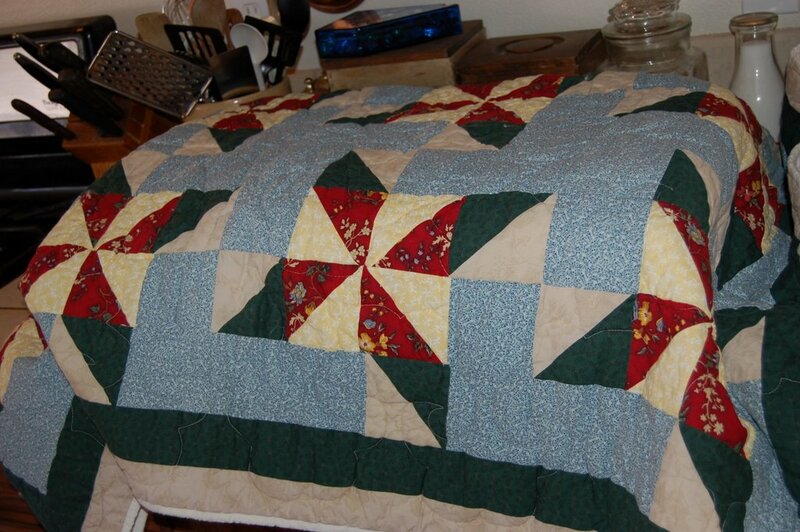 We have another beautiful quilt from my sister-in-law, but it’s in the drier, and I’ll add it to the top when it’s dry. Tomorrow, I’ll cut the block into bars and then let it age for two to three weeks. Soap loses moisture as it ages, so I like to allow some time for it to shrink before I put on my Campbell’s Soap band. This morning I was getting ready for work when from my workroom came the persistent rustling sounds of paper. It had to be our kitten getting into something I would probably wish he weren’t, but I reasoned that he would probably be doing the same thing if I had already left. 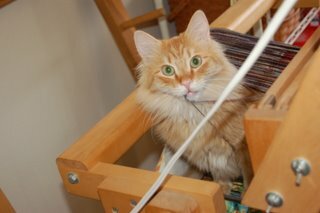 Other than push things onto the floor and sleep in baskets of wool leaving orange kitty hairs, he really hasn’t done anything too terrible. But it went on so long that anxiety got the best of me and I ran up the stairs to determine if anything were in danger. I ran right back down and got the camera. I wrap my warp with Christmas wrapping paper from Costco that we got tired of years ago. It’s just the right width, and the sound I was hearing was Charlie attacking the paper. Who knows what goes on in the mind of a cat and why he suddenly needed to eat the paper, but he was on the back beam, tearing the paper to bits. The only damage he did, other than to destroy the paper, was to tangle with warp from a bobbin sitting on the castle. After I took the picture, I extricated the cat and all is well. More well would be having time to finish weaving that scarf. I admit to typing this with a computer and a cat on my lap. I’ve been bitten by the bag bug, and I’ve been bitten bad. I’m blaming Sara. Here are two more I’ve just finished. I carried the green one today to decide how I feel about the longer straps and I don’t like them at all. They will soon be undergoing a surgical reduction. I keep looking for a bag pattern I like better than this, but so far this is my favorite. I’m going to be taking another fused glass soon and this time I’m going to focus on making buttons. 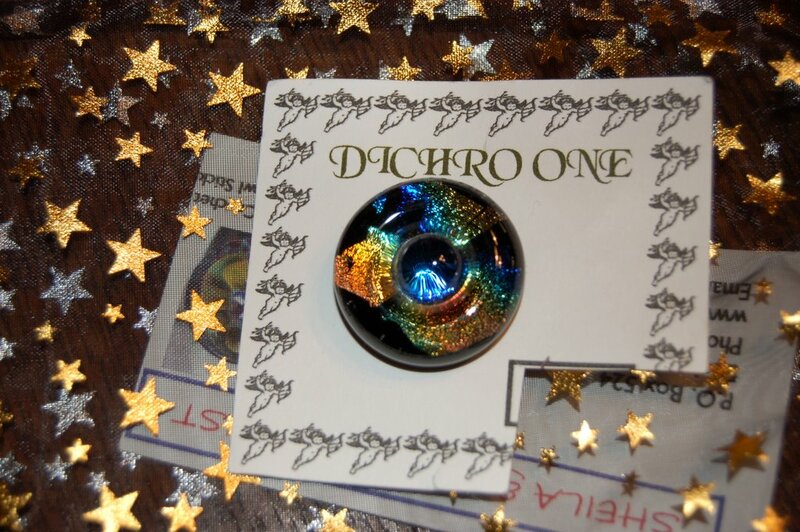 This means that I’m hunting for a bag pattern that will have comfortable sturdy straps and a button flap to showcase my sure-to-be-beautiful buttons with dichroic glass. 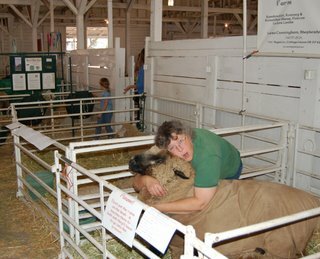 When Stephanie Gausted judged my Romney skein at the fair, I had noted that it was intended for a felted bag. She good naturedly quipped that Romney wasn’t known to make the best felt, but who knew. Maybe she’d get an email someday from the skein’s owner saying that it made the best darned felted fabric ever. But she’s not going to get that email because she was right. 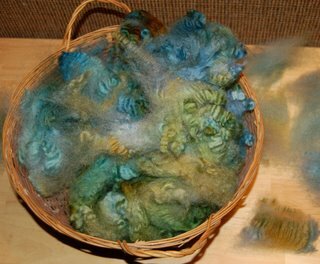 It doesn’t felt well at all, and that’s why I’m so excited to use it in the felted bags. It turns into boucle. I used to shun Romney because I could see no feasible use. Shun no more! 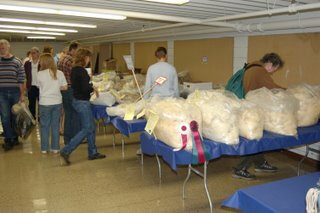 The wool show is smaller than at Black Sheep Gathering and there were a lot of llama fleeces which I found surprising – don’t know why since we bought out llamas from Oregon. Our two have a great micron count, and while I don’t spin their fleece, I do value them as guard animals. I’ve come to realize that I don’t much care to spin hair – llama, mohair, alpaca – just a personal taste and perhaps transitory but nevertheless the taste of the moment. 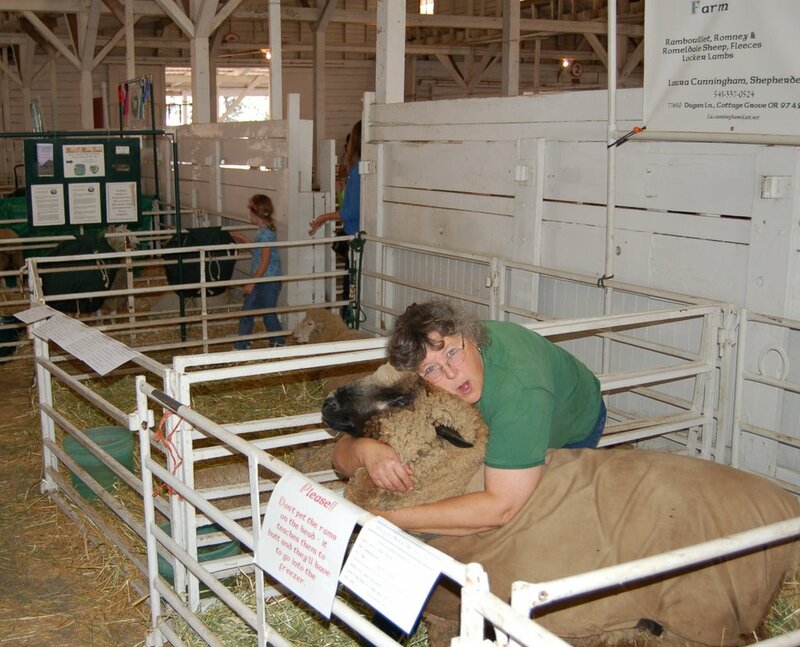 Laura had just introduced us to Mary Beth Bullington when the word came that the wool show results were in. Ian ambled over with Laura and I ended up trotting over with Mary Ann to see what the judges had awarded. It was really gratifying to see her wins since all of our boys are trickle down from her breeding stock. First, let me say that I don’t know how to turn off the flash on our oh-so high tech camera, so each picture has the sun in it. This is the display at our library. All the staff signed up in January to do various displays and bulletin boards. It seemed so far away until it wasn’t. 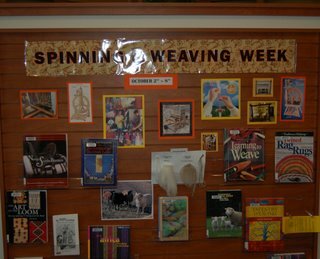 I had blithely committed myself for October and thought I’d throw something together themed for Spinning and Weaving Week. I never gave a second thought to being the only person to sign up for display cases and the main bulletin board in one month. To make things even more harrowing, I had to do the installation the day I got back from vacation. 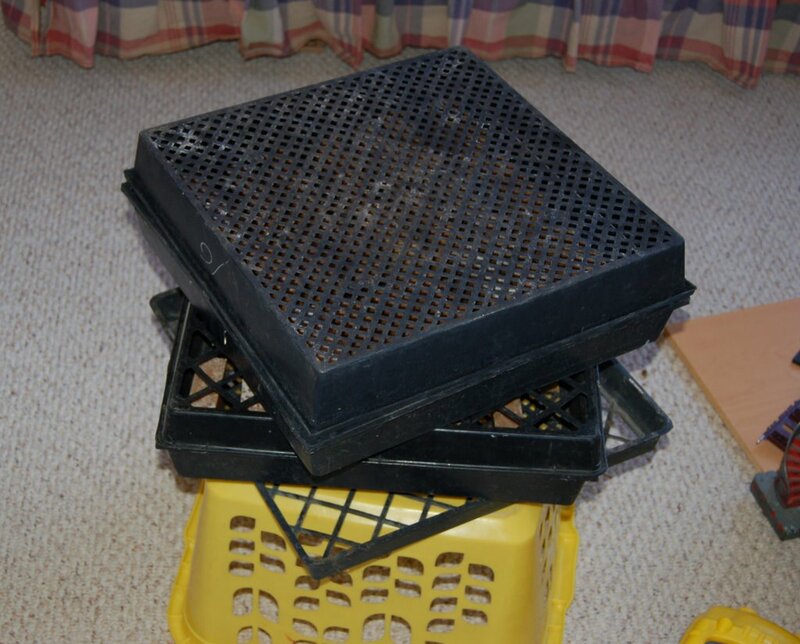 I had two cases to fill so put out two laundry baskets, one for weaving, one for spinning. As I thought of things, I’d toss them in one of the baskets. 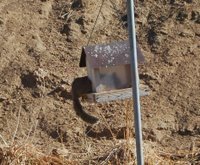 When they were full, I put them in the back of the car. The cases are difficult to fill. There are doors on the back side, so I was working from behind the display. To see what it looked like, I had to get up and walk around to the front. Lots of creaky knee business going on. 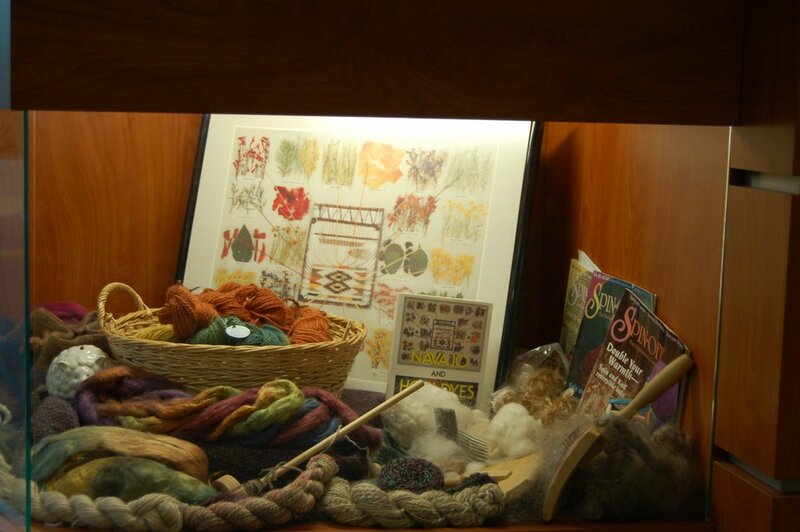 I've got fleece in the car in rolled down grocery sacks and will add it to the bulletin board display area so people can play with it. The displays aren’t as artfully arranged as I would wish, but the response has been gratifying. I have come to the conclusion that I am an evangelical fiberist – a fibergelical? I think people are ready to find a medium for personal expression - I know what spinning and weaving mean to me. I think a lot of us are just plain WalMarted out.